American filmmaker Derek Cianfrance takes on too much at all at once in "The Place Beyond the Pines," an over-stuffed, hyper-pulpy, and mostly trite trifurcated drama about family, crime, and moral ambiguity. Cianfrance's film, his follow-up to the similarly lop-sided, but otherwise superior "Blue Valentine," follows four men: a daredevil motorcyclist who becomes a bank robber, a mealy-mouthed smalltown cop who's not the hero his peers think he is, and their respective sons. Aesthetically, "The Place Beyond the Pines" is an unwieldy mix of psychological realism and visual impressionism, so Cianfrance's characters' dialogue is deliberately coarse while his film's mise-en-scène is distractingly mannered. Ostentatiously composed compositions, manic narrative pacing, and a thunderous Sturm-und-Drang score all strain to make a grand tragedy out of four salt-of-the-earth types' contrived stories. The worst of these offenses is Cianfrance's over-mannered direction, which slavishly tries to replicate his characters' emotional confusion in visual terms. In one scene, he shows a married couple talking to each other in bed, and takes great pains to plop viewers into the middle of their conversation, so it feels semi-realistic. But Cianfrance also takes great pains to highlight the moon's reflection on both man and wife's up-turned lips as they talk to each other. That kind of purposeless style-over-substance embellishment is frustrating, but Cianfrance does his talented cast an even greater disservice when he doesn't even show us people's faces as they react to crucial dramatic questions. In one memorably botched exchange, a boy asks his father's friend what his dad was like, and the friend responds with trepidation somewhere off-screen. Both the broad and narrow strokes that Cianfrance and his two co-writers used to sketch out their epic crime narrative are indistinct. The first of the film's three inter-related storylines concerns Luke (Ryan Gosling), a sideshow motorcyclist who learns he knocked up Romina (Eva Mendes), a Schnectady local, when he last blew through town with a traveling circus. Because speed is understandably the thing in Luke's story, everything happens instantly, leaving no time for us to wonder about Luke's motives. He meets Robin (Ben Mendelsohn), a fellow motorbike enthusiast, they immediately hit it off, Luke moves in with Robin, but Robin can't give Luke much work, so Robin suggests robbing banks together, and they rob banks until one such bank job inevitably goes bad. Save for a risibly anti-climactic car chase where Luke is pursued by cops at every turn despite his best evasive maneuvers, these initial scenes are not only rushed, but they're also too in love with the film's pseudo-raw dialogue. Cianfrance and his co-writers want to make Luke look like a realistic tough guy, so when Romina's husband Kofi (Mahershala Ali) tells Luke to get out of his house, the two men puff out their chests and bark at each other a couple times before either man makes a move. But Luke is vindicated by scene's end: his baby son stops crying after he picks him up. Despite Cianfrance's slavish attempts at adding superficial nuance, his film's narrative is also consistently neat and unambiguous. It's telling that when Robin tells Luke that, "If you ride like lightning, you're going to crash like thunder," he's filmed in extreme close-up from below, and his make-up is done up in such a way that it underlines the idea that Robin, a lonely, desperate guy, is characteristically talking faster than his brain can process what he's saying. In this scene, the film's screenwriters are speaking louder than their character. 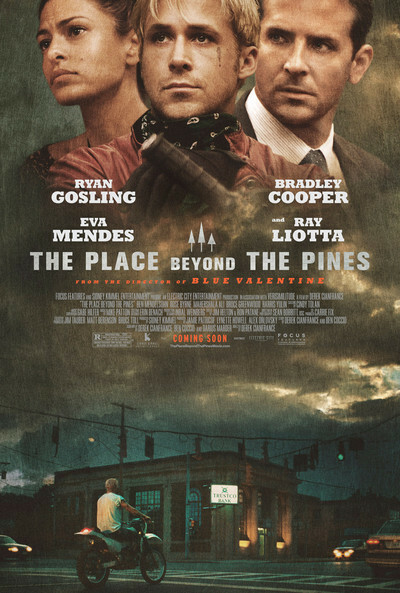 The second storyline in "The Place Beyond the Pines" is the strongest of the three, only because Bradley Cooper gives a surprisingly solid performance as Avery, a cop who gets involved in Luke's story once Luke fouls up a bank job. But Avery's story is also too reliant on pointless aesthetic flourishes, and largely populated by unbelievable characters, many of whom illustrate Cianfrance's banal observations about the pervasive, institutionalized abuse of power (SPOILER ALERT: cops are just as bad as crooks!). The same is basically true of the film's third storyline, in which Luke and Avery's sons settle what their fathers started. Tacky and nonsensical dialogue guilelessly spells everything out, making thematic subtext redundant. The creators of "The Place Beyond the Pines" try to hyper-realistically replicate the disharmony and pathos of real life, but wind up making a flat, jumbled drama that's sadly less than the sum of its many disjunctive parts.